I recently wrote an article on 7 fruit ice cream recipes which was really popular so I decided to stay with the fruit theme for today’s recipe. In Melbourne at the moment, it’s not exactly warm. But that doesn’t mean a summer dessert like raspberry sorbet is off the table. Sure, a large punnet of of raspberries will cost you a small fortune out of season but that doesn’t need to stop you. Simply take a walk down the freezer aisle and get yourself a bag of frozen raspberries. It’s not quite the same as fresh fruit, but you’ll still get a really good sorbet from this recipe. If your budget allows, use fresh raspberries. Don’t stray too far from the recipe or you’ll end up with an icy sorbet that no-one will enjoy. Cool your sorbet base thoroughly before churning. 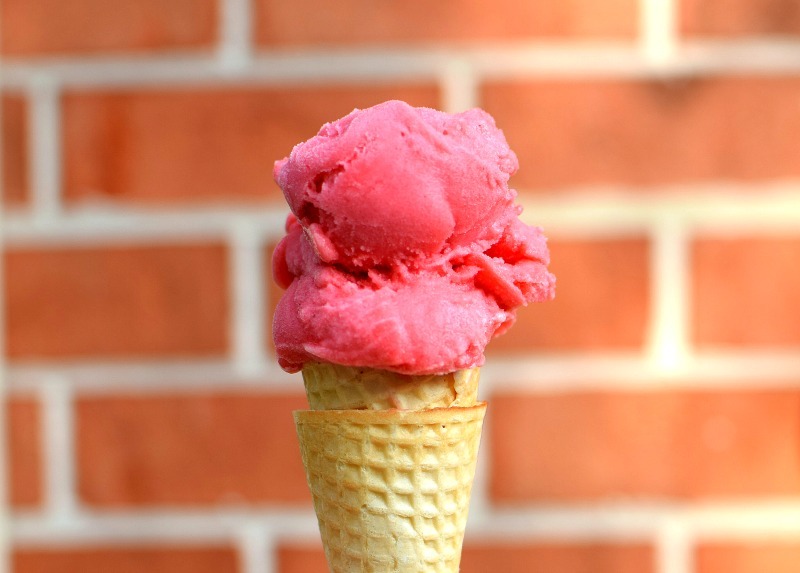 This sorbet is delicious served on it’s own in a dessert plate or on a waffle cone. Instead of adding your mixture to a machine, you can add it to a container and place in the freezer. After half an hour, remove and whip with a whisk or beater. Then continue freezing. Repeat this step two more times every half hour. When you remove your sorbet to whip it up, it’s important you work fast so that it doesn’t have time to melt. Add the water and sugar to a medium saucepan and stir on a low heat until dissolved. Continue to cook for a little longer (around 60 seconds). Pour sugar syrup into a large bowl and add the squeezed lemon juice. Blend the raspberries in a food processor then pass through fine strainer to get rid of the pips. Combine the raspberries and sugar syrup then add to fridge for at least 3 hours to cool. Scoop into an airtight container and freeze until hardened (2-3 hours). 6 Replies to "Raspberry Sorbet Recipe"
Your Raspberry Sorbet Recipe is amazing, I am headed to the kitchen to make it! Hope you are having a great weekend and thanks so much for sharing with Full Plate Thursday this week. Plenty of fresh/frozen raspberries in my freezer that I was keeping to make jam, so instead I will give a go at making your recipe on the weekend.